"It's been a great ride," Lance Armstrong said on his official Twitter account Monday. The race starts Saturday. 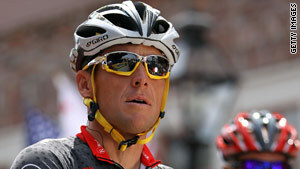 (CNN) -- Lance Armstrong's official Twitter account says this year's Tour de France will be the cyclist's last. "And yes, this will be final Tour de France. It's been a great ride. Looking forward to 3 great weeks," the post says. In May, Armstrong shot down allegations from former teammate Floyd Landis that he used performance-enhancing drugs. Also in May, Armstrong was taken to a hospital after crashing in the Tour of California race. Armstrong is a record-holder in the cycling world and also famous as a cancer survivor. He won seven Tour de France titles in 1999-2005, and he beat cancer after it had spread to his lungs and brain. He launched the Livestrong Foundation in 1997. The foundation makes the popular yellow bracelet accessory and has raised more than $325 million toward fighting cancer, according to its website. Armstrong placed third in the 2009 Tour de France after a four-year hiatus from the race.